Because it airs live, Saturday Night Live is an open invitation for troublemakers. ... But by far the show's biggest controversy was in 1992, when Sinead O'Connor followed her performance by declaring "Fight the real enemy!" and proceeding to rip a picture of Pope John Paul II in two. October 3, 1992: Sinéad O'Connor appears as the musical guest on "Saturday Night Live." Toward the end of the show O'Connor performs a remarkable a capella version of the Bob Marley song "War," which Marley wrote using words from a speech given by Ethiopia's last emperor, Haile Selassie, who died in 1975. The song basically says war is an appropriate response for victims of racial injustice, child abuse and other types of cruelty. At the song's conclusion O'Connor held up an 8" x 10" color photo of Pope John Paul II, ripped it into pieces and said, "Fight the real enemy." Sinéad says she used to feel suicidal but medication has given her a new outlook on life. "Everything just became too much, and the best way I can describe it to you is you're so sad, just terribly sad, that you're like a bucket of water with holes in it. Every pore of you is crying and you don't even understand why or what," Sinéad says. "I actually kind of died and got born again as a result of taking the meds and having a chance to, you know, build a life." Sinéad says she feels sorry for the scrutiny today's pop stars like Britney Spears live with. [NOTE: as do I.] "I think it's terrible what the media are doing to her here," Sinéad says. "I feel so sorry for celebrities in this country. It's absolutely impossible to live a normal life being followed around, poor girl. We all mess up, don't we, as moms. We never always get it right." 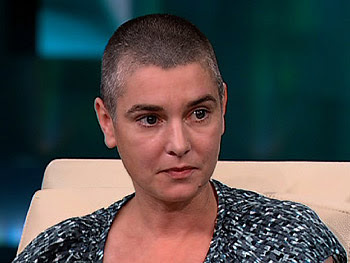 I have always admired Sinead, and her appearance today was great. I saw her a few weeks ago in Denver and she is amazing -- a true artiste. She is an inspiration that says "the past does not equal the future"